This is a really nice summer dinner inspired by Food and Wine. 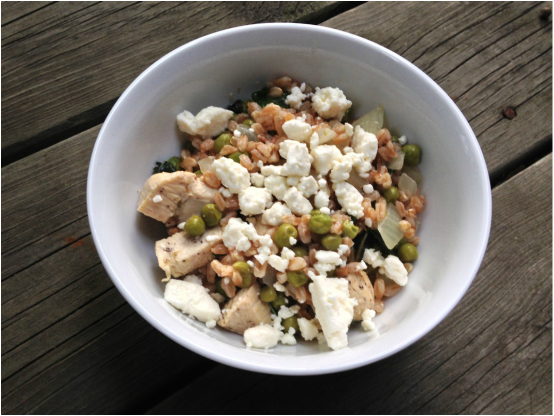 The flavors of mint and feta go surprisingly well together and are very refreshing. 1. Boil 2 cups of water. Simmer over moderately low heat until the farro is al dente, about 25 minutes. 2. Heat 1 tablespoon olive oil. Add the garlic and onions to the saucepan and saute for a few minutes. 3. Add chicken and cook through. Season with salt and pepper. 4. Add peas and lemon juice. Cook until peas are heated. 5. Fold in the feta, mint and oregano, season the salad with salt and pepper and serve warm.